HIGHS in the 30s and snow! I've come to the conclusion that Mother Nature is upset with me. I just wish she would tell me what the heck I did, so we could hash this out and get it over with, for crying out loud! I totally understand about the weather. It always happens to us also. When we need to be outside, it's crappy. When we are stuck inside, it's gorgeous. I hope your weather prediction turns out to be wrong. As for the bed? Yeah, that's just something we don't do. 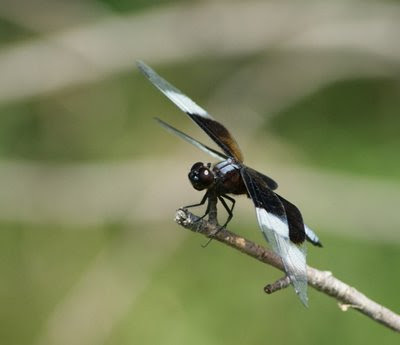 I pull the covers up every day... not sure it's MADE... now... what dragonfly is that... looks like a skimmer, but I don't recognize that with pattern.